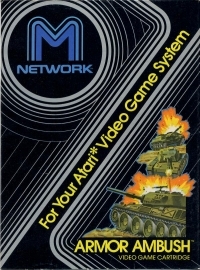 Description: Armor Ambush is the Atari version of the Intellivision Armor Battle cartridge. 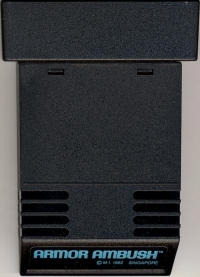 Box Text: For 2 players. 2 skill levels. Harder game adds danger from ricochet shots. Each player has 2 tanks per battle. You'll fight one at a time, but you can switch command from tank to tank. Battlefields keep changing. Tanks move fast on roads slower through trees, slowest through water. Simulated battle sounds and visuals-"cannon" fire, tanks "explode" after 3 direct hits, etc. 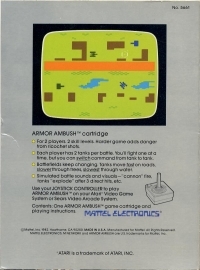 10-13-2012 exonerator Description Armor Ambush is the Atari version of the Intellivision Armor Battle cartridge. 01-31-2012 pacpix Box Text For 2 players. 2 skill levels. Harder game adds danger from ricochet shots. Each player has 2 tanks per battle. You'll fight one at a time, but you can switch command from tank to tank. Battlefields keep changing. Tanks move fast on roads slower through trees, slowest through water. Simulated battle sounds and visuals-"cannon" fire, tanks "explode" after 3 direct hits, etc. This is a list of VGCollect users who have Armor Ambush (Black Label) in their Collection. This is a list of VGCollect users who have Armor Ambush (Black Label) in their Sell List. This is a list of VGCollect users who have Armor Ambush (Black Label) in their Wish List.